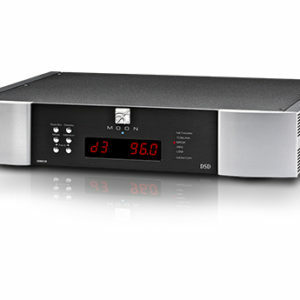 Integrated Tube Amplifier, option MC phono, 2 x 60 Watt. Output Tubes: 4 x 6550, options: EL34 and KT 88. 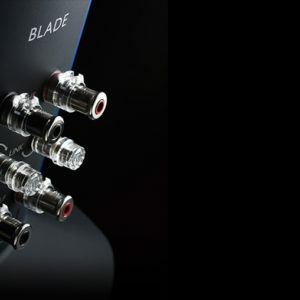 The V 70 SE features a total of five single-ended (RCA) inputs (including the Home Theatre Bypass input). 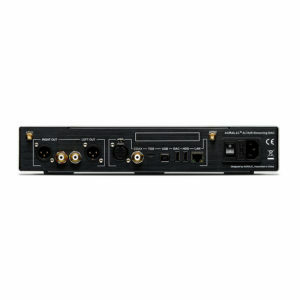 Outputs included are one RCA Record output, one regulated Preamplifier output and one Loudspeaker output. The dynamic and tonal stability of an amplifier is strongly dependent upon the stability and capacity of the power supply, therefore the Black Box and Super Black Box were developed as external upgrades to the OCTAVE amplifiers’ power supply storage capacitors by increasing their capacitance by a factor of 4 (Black Box or 10 (Super Black Box), respectively. This is a tremendous benefit if the speaker is difficult to drive. 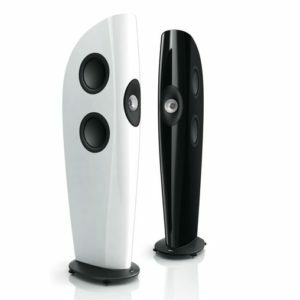 Loudspeaker efficiency is made less critical, while the amplifier is enabled to handle speakers with extremely low minimum impedances. 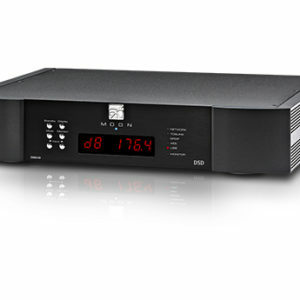 A forward looking feature of OCTAVE is the unique ECOMODE power saving electronic circuitry developed to reduce heat and unnecessary power consumption when the amplifier is switched on but not in use. 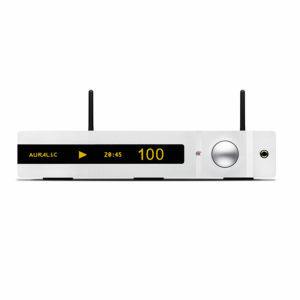 This electronic system controls the power condition and reduces power consumption when the amplifier does not receive a signal for a period exceeding 10 minutes. In this “sleep” mode, the V 70 SE draws only 20 W idle current. Virtually no heat is produced by the unit, and the heater voltage and the high voltage for the power amplifier section are switched off. When a signal is detected by the V 70 SE, the Ecomode circuit will turn the amplifier back on, with a warm-up/start-up delay of approximately 30 seconds before the unit will operate. Ecomode also serves to increase the lifetime of the tubes, while having an added benefit of improved safety allowing the V 70 SE owner a level of security against any problems when leaving the unit powered on. 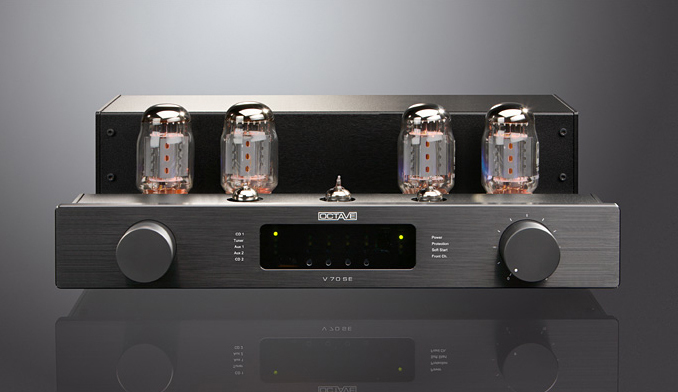 The Output stage of the V 70 SE operates in Class A/B, and therefore requires an adjustable BIAS regulation. The highly sophisticated yet extremely simple yet accurate BIAS calibration system is accessed on the front panel of the unit. It utilizes external precision bias trim pots and LED confirmation, allowing the user to readily monitor the output tubes and simply correct their bias individually at the front panel – without the need of a micrometer let alone any special knowledge or tools. The correct BIAS is vital for the constant sound quality of the V 70 SE. Due to this facility there is no need for a technician to service the V 70 SE for changing or tubes or to check their condition. The precision of this user friendly system is within 0.5% accuracy. The V 70 SE is equipped with a multi-stage Soft-Start/Turn-On protection circuit which extends component as well as tube life considerably by protecting against stress caused by typical high inrush currents during switch-on. The unit starts in a defined sequence, with the Protection System monitoring the V 70 SE completely, and activated whenever a malfunction is detected. Once the Protection is activated, the V 70 SE is powered down.